Discussion in 'Feline Health - (The Main Forum)' started by Larry E Billig, Jan 18, 2019. Welcome! There's a lot of help available here for a wide variety of kitty health issues. We tend to focus on how those might impact a diabetic cat. Has she had her mouth checked for dental disease? Has she had a dental cleaning recently? Have you tried feeding her canned food in small amounts at a time (a few teaspoons)? Will she slowly eat a full meal if fed the way you're doing? We had her teeth cleaned a couple months back and a blood test was done and she wasn't diabetic. It wasn't too long after the cleaning she became this way. She doesn't necessarily like canned food but the wife sometimes gets some in her. She will eat a full meal, its just the fact that we have to start out with 3 pieces wait ten minutes, then five, then seven, and then you can pretty much let her eat what she wants but we still don't let her completely finish it all at once. Sometimes she even throws up the 3 pieces we start her on. It seems like her stomach is super super sensitive to start for some reason. Maybe an acidic stomach. I would try a acid reducer like 1/4 of a 10 mg tablet of Pepcid AC (genetic is famotidine and is less expensive) once a day. JanetNJ and Kris & Teasel like this. I'm checking with my vet on the acidic stomach thing. The girl that works at the vet's office said the barrium would have shown any esophigas(excuss the spelling) problems but she is going to ask the vet himself. Thank you all for the help. Usually the acid reducer is temporary. However, there are some conditions where it can be long term. In that case famotidine is not the acid reduce of choice. That’s pretty common. I am surprised your vet didn’t suggest it. I am sure Larry will take a check. Any time you have a question don’t hesitate to ask. There's lots of collective experience in this forum. If your cat is diabetic you're going to want to give up that dry food though. Even the dm food is too high in carbs. The wife and I both work and nobody is home during the day to feed them in shorter durations. Auto feeder won't work either because we have another cat and he is fat and on a diet. She isn't diabetic but the other one is. She still has a tendency to regurgitate I think after drinking water beforehand. What type of acid reducer would be used for long term in case it's needed? Thank you all again..
One like this only opens for the cat you want it to open for. Janet, you state, "one like this". There is no photo or attachment? The cat is an extremely finicky eater. We have to sort of chase her around with the food bowl let alone make sure bowl is elevated. 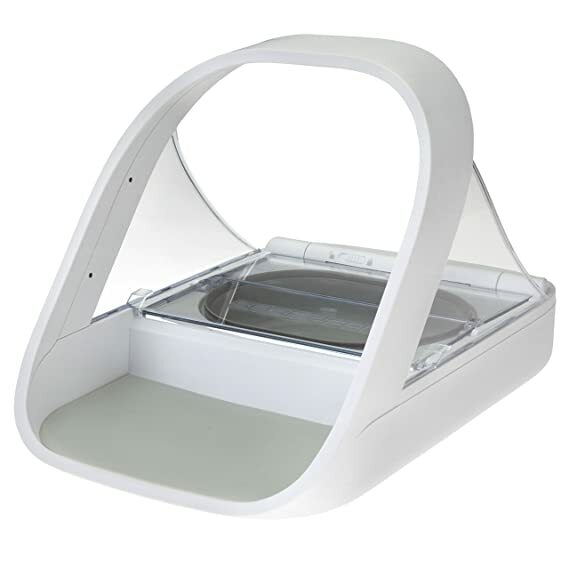 I think the pet feeder Janet is talking about is the surefeed microchip pet feeder. It comes with a tag you can put on the pet's collar if the pet doesn't have a microchip. I have one for my cat and it opens when she comes to it so she can snack whenever she wants. There's an additional plastic piece (which you might not need) that you can get to go around the back of the feeder if case your other fat cat figures out how to snitch food while the first cat is eating. You have to ask for this piece but they'll send it to you for free from the manufacturer. Thought the pepcid was working but still having problems. I've had her on it for almost two weeks now but still have to start her with only approx. 4 kibbles to start. You can see her stomach react sometimes as soon as it hits her stomach, like she is going to throw up. After 10 minutes or so she seems alright. Sometimes though she can start and we let her go and it don't seem to bother her but we usually don't let her over indulge too much. It's usually that initial shock of the food hitting the stomach? She swallows hard sometimes also like it's acid but we give her a quarter of a pepcid in the morning and a quarter at night so the pepcid should have the acid under control. She is very finicky also. One minute she won't eat the food and then one minute later she will. Plus we offer a variety of good food such as Science Diet (2 versions), Pro Plan sensitive stomach, and canned. Usually if we put the bowl under her nose persistly she will try and then start eating it like mad. Anymore ideas would be great. I want to thank you all for your concern and help. I would talk to your vet. It appears that your cat (name?) has an acid stomach. A better acid reducer is omeprazole (one trade name is Prilosec). 1/4 of 20 mg extended release tablet/caplet twice daily. I have over thousand dollars spent on this vet and he come right out and said he didn't know what it was. I will try the prilosec though. When she (Missy is her name) eats dry food she will sometimes let pieces fall out of her mouth but not alot. I read somewhere this could be a symtom of some other problem but I thought it was normal plus the fact she doesn't want the food sometimes. Thank you again..
1/4 of a tablet twice a day? Websites say once a day. Plus I take Omeprazole once a day. I know about Omeprazole because my BunBun was prescribed it (1/4 of 20 mg twice daily) for his cancer. He was on it for over six months before he succumbed to the cancer. Sorry to hear about your loss. It hurts to loose a cat, especially one you've had for a long time. Well you sold me! The test the administers and the detailed results convinced me. We started Missy on it this morning. Thank you very very much again..
Do you have a college of veterinary medicine in your area who can see your cat? You know, the super-specialists?? Best of luck! Now Missy is suspected of having cancer. What was the diagnosis based on? Being neither the steroids or the antibiotics working. Nothing showing up on xrays or skin. He also put some type of inhaler mask on her for asthma that didn't help. Being he can find it or figure it, plus nothing working. He thinks it maybe medistatic cancer. Metastatic cancer is just cancer cells that broke away from the primary tumor and form other tumors in other parts of the body. One hears about cancer that has metastasized to other parts of the body. My Thunder coughed a lot and finally I went to the vet. X rays showed an abnormality in one of the lungs. It got worse and after I said good bye a necropsy showed lung cancer. She has no cough just heavy breathing such as somebody that just got done running. Not as bad though when sleep or resting. Sometimes she shifts around trying to sleep to get into a position where she can breath better. Petting or loving on her she will really start breathing heavy so we watch how much we pet her. If it gets any worse we will have to put her down. We were hoping this antibiotic she is taking now would eventually work but it hasn't shown any sign of it.